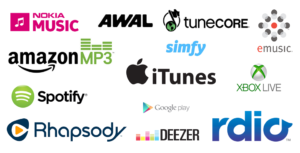 Music distribution is the process of getting music from an artist to store, making it available to the public for purchase, whether that store be a physical or digital music retailer. (But here D18 Studios will be providing a comfortable digital process to get on big platforms easily).This what an artist’s dream for, getting their music live on all big platforms globally like – itunes, spotify, amazon, saavn, deezer & alot more. And one of the most important thing is that you can get revenue (% age revenue share) from your music/songs, an artist can earn. So keeping in mind all the problems that are faced by an indivudal artist..D18 Studios has come up with this exclusive idea in which we will distribute your track on all biggest platform all across the globe (approximately over 60+ big store). Also will be sharing the revenue reports with you quarterly (if any revenue is generated). So give us a call & lets get started.